REGISTRATION FOR VPK IS OPEN! The Voluntary Prekindergarten Education Program – or VPK – is a free prekindergarten program for 4-year-olds who reside in Florida and were born on or before September 1st of each program year. For the 2019 program year, children living in Florida must have been born between September 2, 2014 and September 1, 2015. After reviewing the application and supporting documents, ELC staff will email families their Certificate of Eligibility within five (5) business days. Families must then print the certificate and take it to the provider of their choosing, or they may email it directly to the provider. If you don't have access to a computer or scanner to enroll your child online, visit any ELC Office during walk-in hours (Monday-Thursday, 7:00 am – 5:30 pm) to use our equipment. Readiness Rates are determined by a series of assessments given to public kindergarten students in the first 30 days of Kindergarten. To see an illustration of how VPK Readiness Rates are calculated, CLICK HERE. 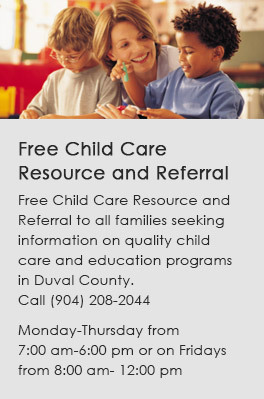 Visit our Reports & Research page to view ELC of Duval's Annual Report, school readiness rates. etc. Providers on Probation (POP) are those who fall below 70% of children scoring "Ready" on the Florida Kindergarten Readiness Screener (FLKRS). The minimum rate is adopted by the State Board of Education. Early Learning Coalitions across Florida are partnering with Florida Pre-Paid College Savings Plan to promote enrollment of your VPK child into this program now and have their college paid for before graduation! Click the image below for more information.